by Danielle Ricks.In Business, Internet of Things, Marketing, News, Resources, Smartphones, Social Media, Technology, Trends, Video. 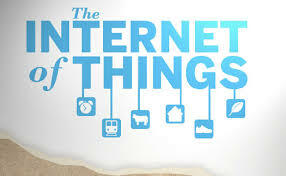 The Internet of Things is beginning to drive the tech industry and soon the marketing and media sector. You need look no further than this year’s CES to see the trend unfold. At the same time, social media is losing luster in the eyes of traditional technologists and marketers. The Internet of Things incorporates Internet capable sensors into many objects in day-to-day life, including current electronics but also new unthought of ones (like refrigerator magnets). Silicon Valley investors like Marc Andressen are focusing on start-ups that leverage sensors. And with good reason. The market opportunity for this new layer of smart things is huge. From a marketing perspective, the Internet of Things allows incredible new possibilities for precision. Connected ads allow brands to serve content based on someone’s demographics as determined by their physical body or the data they willingly surrender via social media, mobile phones, and web cookies. Unique applications can be created (like pizza delivery by pressing the aforementioned refrigerator magnet) or apps like Nike’s sensor-driven Fuelband. He goes on to share: It’s not that businesses won’t continue spending on social or that PR people/community managers will be out of work. Far from it. Social isn’t going anywhere. In fact, it’s a primary driver of data needed for contextual media and word of mouth trust. Social remains a valuable asset for companies. It’s not that businesses won’t continue spending on social or that PR people/community managers will be out of work. Far from it. Social isn’t going anywhere. In fact, it’s a primary driver of data needed for contextual media and word-of-mouth trust. Social remains a valuable asset for companies. It’s just that, well, social media marketing is not new anymore. You could argue that companies are in the learning phase, but last I checked they were still determining how to build a decent website, too. I think social media marketers need to focus on how and where their interactions impact the customer acquisition life-cycle. We know now that social is not just top of the funnel, but an actual medium that touches various points. Where do you fit in, and how do you make sales increase? I think social media marketers need to focus on how and where their interactions impact the customer acquisition life-cycle. We know now that social is not just top of the funnel, but really a medium that touches various points. Where do you fit in, and how do you make sales increase? This post originally appeared in AllThingsE. Read the full story here.